sale directly to the public! Your Fresh Flounder fillets will average between 4-6 ounces. 1 lb. Fresh Flounder, large fillet + 4 lbs. Add. Selections = 5 lb. Total Order OK! Place Flounder fillets in lightly oiled baking dish. Melt Butter over medium in a skillet. (be very careful not to burn the butter). Add juice from Lemons (watch out for steam or splatter!). Add Black Pepper and chopped Parsley. Cook fillets in 350° oven until they flake easily with a fork. Drizzle Meuniere Butter over Flounder and serve. 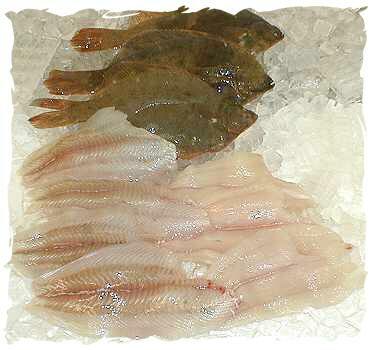 For additional information on Fresh Flounder, large fillet, please e-mail AlwaysFreshFish.com.